For eight years, Brennan Buckley was the senior vice president of marketing for Iowa Realty. Now he carries the title of senior vice president and general manager, a newly created position. His passions in life are his family, his work, golf and exercise, and his proud Irish heritage. I grew up in Marion, Iowa, near Cedar Rapids. How did you happen to choose to major in advertising at Iowa State University in Ames? What drew you to that field? It was a natural, really. My father was an advertising executive. I grew up as an “ad kid,” often appearing in commercials. I became a junkie of advertising and advertising history. At the time I was starting college, the Greenlee School of Journalism and Communication at Iowa State was starting an advertising major. Through my dad, I grew up knowing Bob and Diane Greenlee, so it was a natural. Over time, it has just been fascinating to me how advertising has transitioned from print only to web-based platforms, too. My wife, Sarah, is the corporate communications and marketing vice president at GuideOne Insurance in West Des Moines. We have two kids, Liam, 11, and Lucy, 10. They certainly are influenced by real estate. Let’s just say we watch a lot of Home and Garden Television (HGTV), which has become a cultural phenomenon, and we look at lots of houses online. Everybody in the family likes houses, to be sure. The other day, in fact, Lucy said she wants to be a real estate agent when she grows up. With both of you having high-powered positions, how do you and Sarah decompress and hit the balance button? Neither one of us has a 9-to-5 job, so evenings and weekends are pretty special. Our family is our focus, and exercise helps when you have intense jobs. That being said, I get to work with wonderful people, both agents and the corporate staff. I enjoy and respect each and every one of them. Other commitments in your life? I have been president of the I Have a Dream Foundation, which helps motivate and empower children from low-income areas to reach their educational and career goals. Sarah and I mentor an 8th-grade student and his sister. We consider them part of our family. I’m also on the advisory council of our church and the advisory board of the Greenlee School at Iowa State. Plus, I have coached my kids’ teams. You have been at two advertising agencies, CMF&Z and The Integer Group, and now Iowa Realty. Has the focus changed each time, or is marketing “marketing” no matter where you are? In essence, marketing is part of nearly every job in every field. It’s certainly a huge part of what we do here at Iowa Realty, from print to television and many other digital platforms. What are your goals as general manager? Iowa Realty is a brand, in business for 60-plus years with nearly 600 agents in central Iowa. It’s my goal to help this company continue to grow as a market leader. What’s ahead for Iowa Realty and other real estate companies in the Des Moines metro? Are there changes or trends in how you will continue to do business? Put simply, the bottom line is that our mission is to bring buyers and sellers together for what likely will be one of the biggest financial decisions they’ll ever make. 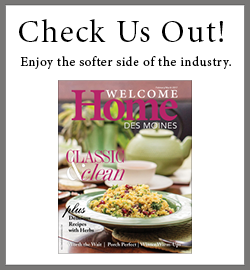 Please discuss existing sales, new construction, and development in the Des Moines metro. While there have been ups, downs, and now ups in the economy, real estate in the Des Moines metro area continues to grow steadily over time. Des Moines is a good place to live, and so is the entire state of Iowa. Numerous national magazines have recognized that, when they name us to lists of good places to raise families and to grow businesses. We will continue to grow in all four directions. Western areas continue to thrive. Look at the northern growth, with Ankeny and the massive expansion up there. Altoona and other eastern spots are growing, with the announcement of a new outlet mall and the Facebook data center. And on the south, growth continues with the announcement of a Microsoft data center and development along the Highway 5 bypass and in Norwalk. Certainly, my family. But also, I love working with agents who help people make the biggest purchase of their lives when they buy a home. It really is a wonderful profession. Do you have time for any hobbies? What do you do for fun? For fun, I love to follow my kids’ activities, exercise, play golf, read, and travel. We have taken our kids to Europe twice already. Please discuss the charming Irish coincidence involving a former home that you and your wife purchased. It’s priceless. My dad, who loves genealogy, took my brothers and me to Ireland about 15 years ago. We visited a woman in County Clare, with whom my father had visited 20 years earlier. She said she had a photo of another Buckley relative who had stopped at her house 20 years before my dad. It turns out the photo was of my dad’s uncle. Back in Des Moines, my wife and I purchased our former home south of Grand. When my dad, who has a metal detector, came to visit once, he found a 1933 Irish coin in the front yard. On an instinct, we checked the abstract, and sure enough, that uncle used to own the house we had just purchased. Amazing. Since then, I have worn that coin on a chain around my neck. I never take it off.